The body relies on oxygen-rich nutrients to operate properly. These nutrients are carried through the blood pumping to all parts of your body. Difficulty in performing normal tasks such as walking upstairs or carrying packages. Heart Failure is a serious condition and there is usually no cure. You can, however, lead an enjoyable life if you follow your doctor’s instructions, take your medications as prescribed and follow a healthy lifestyle. A type of heart, known as congestive heart failure is a type of heart failure, requires seeking timely medical attention. Stretching - the heart muscle contracts more strongly causing the heart to become enlarged. Increased muscle mass - the contracting cells of the heart get larger to pump with more strength. The heart pumps faster to increase output. To keep blood pressure up, the blood vessels narrow. Blood is diverted away from less important parts of your body to provide more blood to the brain and heart. This can lead to other problems like kidney disease. These compensation mechanisms explain why some people may not become aware of heart failure until years after its decline. This is a good reason to have a regular checkup with your doctor. Heart failure usually affects the left side first but can include the heart's left side, right side or both sides. Anyone can develop heart failure but is more prevalent as we get older. This is a serious, chronic condition requiring proper medical follow up and proper lifestyle changes and taking medications as prescribed. 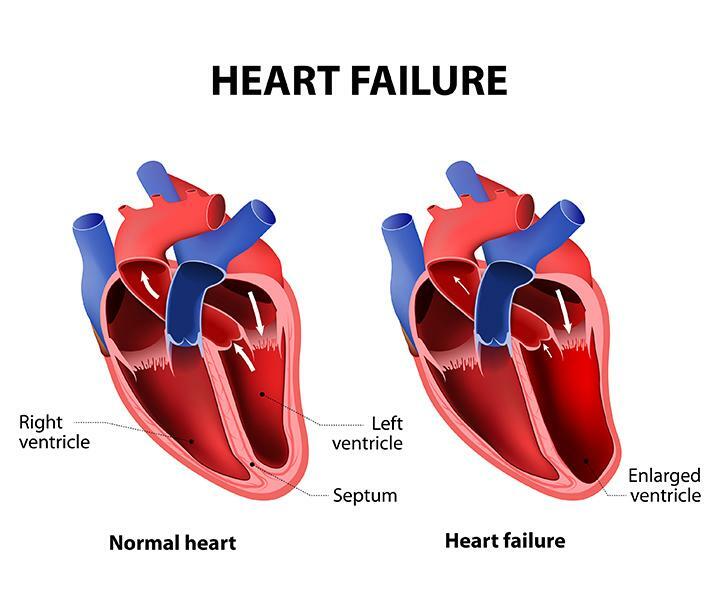 Heart failure usually occurs in people who have experienced another heart condition first such as coronary artery disease high blood pressure and/or a previous heart attack. Proper management if you have been diagnosed with one of these conditions is essential to help prevent onset of heart failure. Congestive heart failure is a type of heart failure that requires timely medical attention. One of the above warning signs of heart failure by itself may not be cause for alarm. But even if you haven't been diagnosed with any heart problems, you should any of the warning signs to a healthcare professional so he or she can make an evaluation of your heart. It is also important to report any additional signs that may occur to your medical professional immediately.